– “Us Conductors” by Sean Michaels (***signed copies available! ***) – This book won the Scotiabank Giller Prize and a signed copy always makes an extra-special gift. – “John” by Cynthia Lennon – We have a huge selection of music-related books about different musical genres or specific artists. – Three surprise Classic books – One of our most popular gifts is our mystery surprise packs of secondhand books. We also currently have Fiction and Canadian Fiction packs in store. The bonus? They’re already gift-wrapped and ready to go and at only $9.95 for three books, you’re getting an amazing bargain. – “Dad is Fat” by Jim Gaffigan – Sometimes as a parent, all you can do is laugh until you cry. Or cry so hard you need a laugh. Something like that. 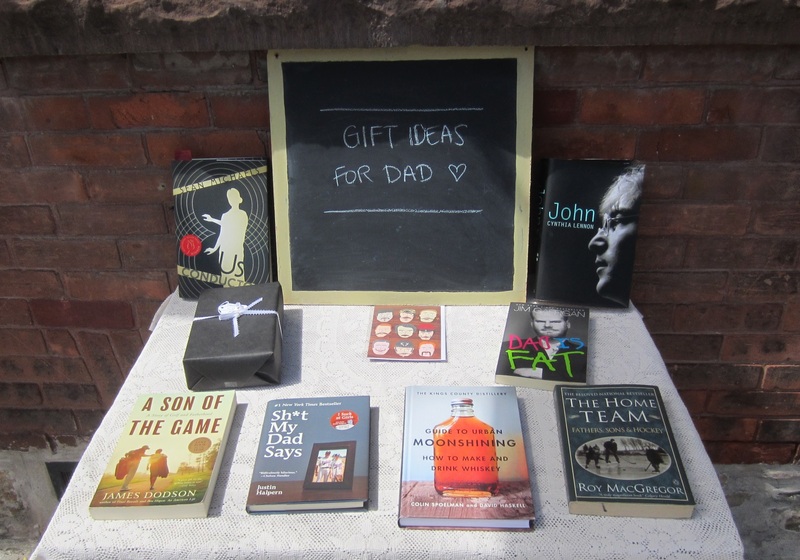 For the dad with a great sense of humour. – “A Son of the Game: A Story of Golf, Going Home and Sharing Life’s Lessons” by James Dodson – An inspirational memoir about fathers, sons and, well, golf. This one’s a secondhand pick for just $4.95. – “Sh*t My Dad Days” by Justin Halpern – Another option for the dad with an oddball sense of humour. This book’s a memoir about the twenty-something author living at home again with his 73-year-old father…so let’s hope his dad had one too. – “The Kings County Distillery Guide to Urban Moonshining: How to Make and Drink Whiskey” by David Haskell and Colin Spoelman – Raise a toast and treat your dad to this Backbeat best-seller. – “The Home Team: Fathers, Sons and Hockey” by Roy MacGregor – A great Canadian book about the great Canadian game, this book features the personal tales of some of the sport’s greatest heroes including Wayne Gretzky, Gordie Howe, Mark Messier, and Guy Lafleur. This secondhand book is priced at just $4.95. You can top off your gift with one of our best-selling cards – the one with the mustaches. It’s only $3.95. Of course, we also have tons of great new and used albums, locally made wooden record crates and accessories for the music-loving dad, so come on by and browse our huge selection. You won’t leave empty-handed.